Haymarket Square was located on Randolph Street just east of Halsted, about where the Kennedy now comes through. On this date in 1886, the site became infamous. Chicago was having labor troubles that spring. On May 3, two striking workers had been killed in a confrontation with police at the McCormick Reaper Works. 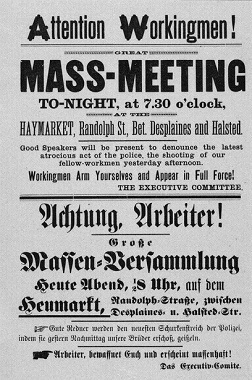 A local anarchist group called for a mass protest meeting at Haymarket Square the following evening. Something like 2,000 people came to the rally. Mayor Carter Harrison was one of them. He saw things were peaceful and left. The speakers continued for three hours. Light rain began falling. People drifted away. By 10:30 about 300 stragglers remained in the square. Samuel Fielden was the final speaker. He climbed on the wagon that was being used as a stage and began his remarks. A few police officers had been on hand during the rally. Now a larger contingent arrived. The police halted. Inspector John Bonfield called out, “In the name of the law I command you to disperse.” As the cops began to move forward again, someone threw a pipe bomb into their midst. The bomb exploded. Then the shooting began. Five minutes later it was over. A century-and-a-quarter later, just what happened during those five minutes is still a matter of dispute. Did the anarchists start firing guns at the police? Did the cops begin shooting blindly into the crowd and hit each other? It depends on whom you listen to, and how you interpret the accounts. Eight officers died. About 60 were wounded. The number of civilians killed or wounded was never determined. “A Hellish Deed” read the front-page of the next day’s Tribune. That was typical of the general public opinion. 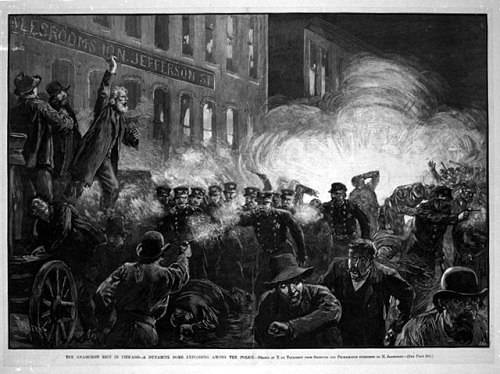 The anarchists were blamed for the violence. They were thought to be preparing for another blood-bath like the French Revolution. Officer Matthias Deegan had been killed by the original bomb. Eight anarchists were eventually charged with his murder, tried, and convicted. One of the defendants received a 15-year prison term. The rest were sentenced to death. 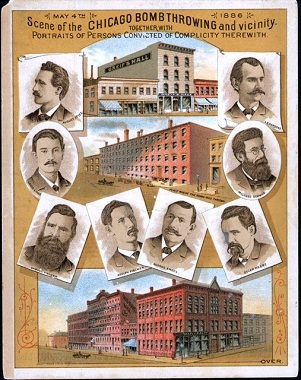 Four of the condemned seven were hanged on November 11, 1887. A fifth committed suicide. The other two–including the speaker, Samuel Fielden–had their sentences commuted to life imprisonment. In 1893 newly-elected Governor John P. Altgeld re-examined the case. He concluded that the trial had been a miscarriage of justice and pardoned the three surviving defendants.